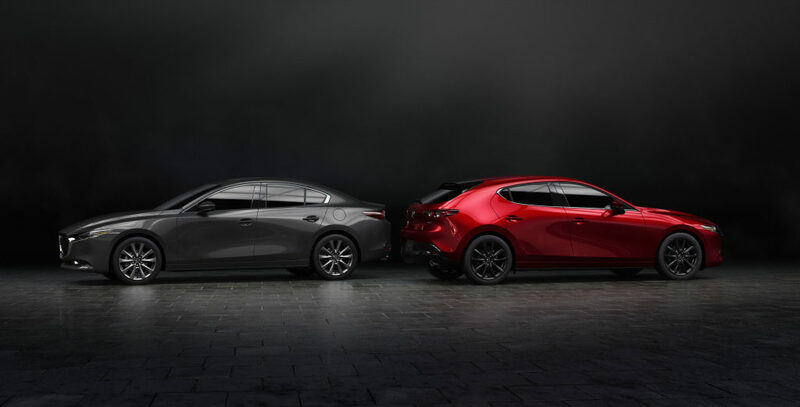 The next-generation 2019 Mazda3 revealed this week boosts the amount of ultra-high-strength steel 980 megapascals or higher to 30 percent of the vehicle body, a dramatic increase over the 3 percent in the prior generation. “This combines with the addition of a new perimeter beam and rear side frames that deform in an accordion-style pattern to create a solid body that can stand up to impact force and a frame structure that effectively absorbs energy,” Mazda wrote in a news release Tuesday. 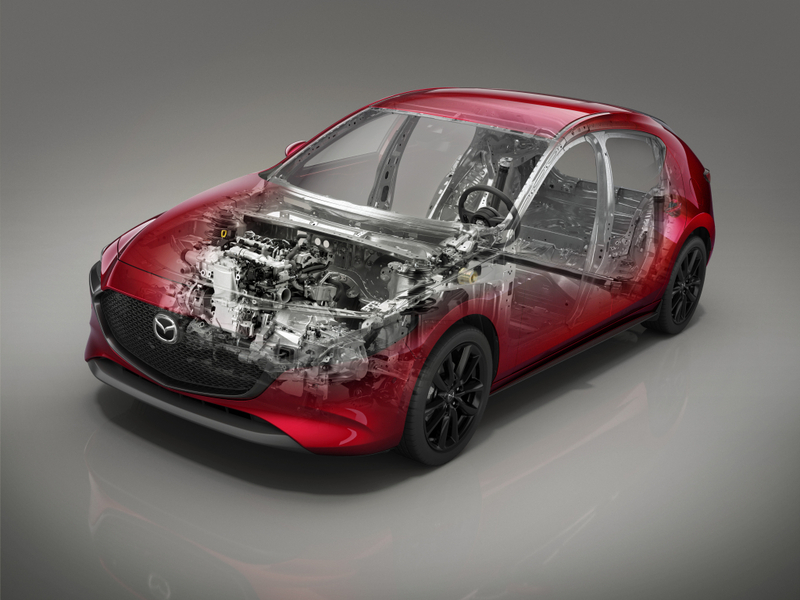 Collision repairers will need to study repair procedures to ensure they’re restoring the crashworthiness of this new structure, which is the first example of Mazda’s Skyactiv-Vehicle Architecture platform to reach the market. Higher-strength steels can carry more repair restrictions. Mazda sold 75,018 Mazda3s in 2017, so you’re very likely to see one in your shop. Mazda also described changes to the Mazda3’s hood and front bumper which could demand a repairer only replace them with OEM parts to preserve safety — not for your customer, but any poor pedestrians they happen to strike. The Mazda3 also is the first example of a driver’s knee airbag on a Mazda car — a piece of technology Mazda says will come standard worldwide. The addition means body shops will face higher severity and repair complexity. According to Mazda, this protects the driver’s chest as well as their legs. Suspension: The Mazda3 has front MacPherson struts “and a newly developed torsion beam setup in the rear.” The OEM also changed the suspension geometry and used a “new spherical shape” for the bushings’ interior structure. “By considering the carpet and the body panel as two walls, and then designing them to match the characteristics of the fiber material attached to the carpet increases efficiency without increasing weight,” Mazda continued. The car’s floor mats and headliner have also been upgraded to reduce high-frequency noise, and Mazda said the tires’ “optimized vertical spring action and increased rigidity at possible entry points” cut vibration. This raises an interesting question about whether customers would notice a difference if they — or the shop — substituted aftermarket floor mats or tires. Painting: Mazda said it developed a new color, “Polymetal Gray” exclusively for the Mazda3 hatchback, though Mazda press photos appear to show it on the sedan. Mazda hasn’t yet replied to an inquiry if the color will be more complex to refinish, a la its Machine Gray and Soul Red Crystal. Owner’s manual: Mazda Connect has a digital owner’s manual that brings up additional information about whatever alerts appear on the dash. It would be interesting to see if this concept is applied by Mazda or other OEMs to diagnostic trouble codes which don’t illuminate MIL lights. In addition to increasing wiper performance — which could conceivably cut a few crashes — this seems likely to increase severity in instances where the wipers need to be replaced. ADAS: Mazda didn’t specify much about common advanced driver assistance systems, probably because they’ve been standard for a model year and will remain so. The OEM in 2017 announced the 2018 Mazda3 would carry multiple i-ACTIVSENSE advanced driver assistance features standard. These include autobraking, advanced blind spot monitoring and rear-cross-traffic alerts (but not rear autobraking). 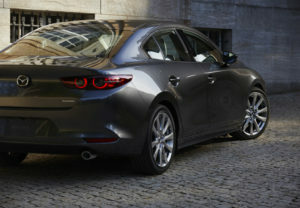 Mazda did on Tuesday flag three driver assistance features it’ll offer as an option on the Mazda3. A new driver monitoring system is available as an option for drivers who don’t mind being scrutinized by their vehicle’s artificial intelligence. The technology will watch you with an infrared camera and LED to see if you’re being inattentive or falling asleep, and sound an alarm to snap you out of it. Mazda said that the technology will work with the Smart Brake Support autobraking technology, but it’s unclear from the news release if the car will stop itself or just alert distracted drivers sooner than the autobrake alarm would under normal conditions. Front cross-traffic alert uses new “front side radars” to look for perpendicular traffic in obscured intersections and avoid unwanted T-boning. It’s unclear if it stops the car or just sounds an alarm. Finally, a “Cruising and Traffic Support (CTS) system” will handle the accelerator, brake and steering “when stuck in traffic jams on the highway.” This sounds like basically another example of partial autonomy under constant driver supervision, which makes it all the more crucial for shops to restore correctly.